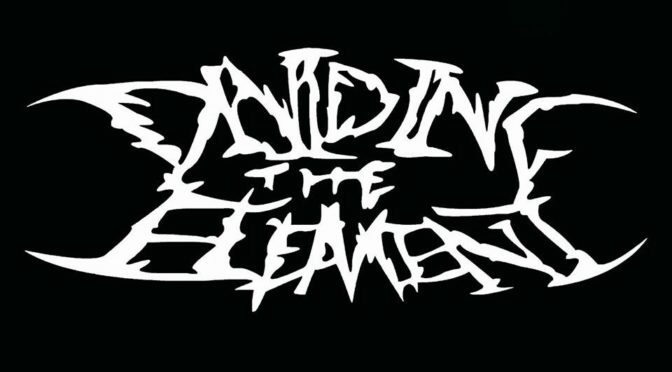 Dividing The Element hails from Zimbabwe and has been around for a while now, playing a modern style of metal with a lot of aggression and vitality. It’s a young scene, fresh in its infancy, but full of power and drive, which is mostly embodied by the band from Harare themselves. The group has been around since 2012 and claims ‘From Zimbabwe, For Zimbabwe’. That’s a great sentiment in a world swamped with bands that sound like they were made in the same factory. 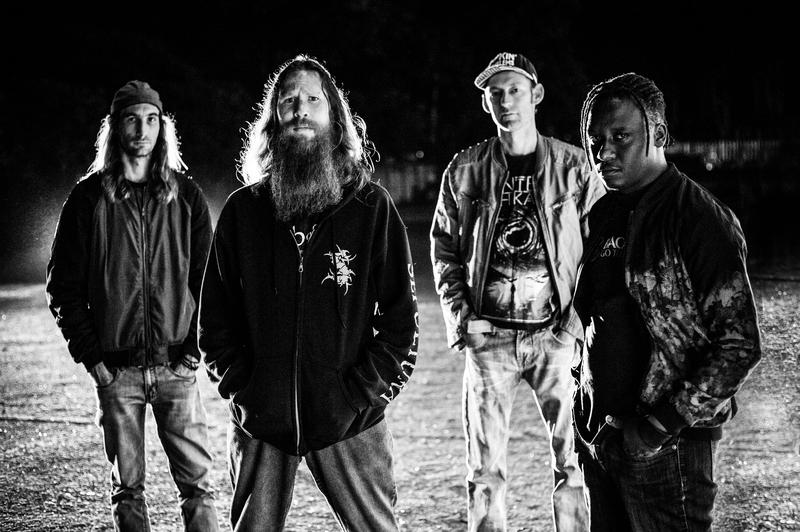 Afro-metal is another term the band uses, as they implement parts of ethnic music and language into their sound. In 2018, the band also dropped their debut record and I had the privilege to ask the band about making metal music in Zimbabwe, their self-titled debut and more, as Chris Van was willing to answer all my questions. DTE is comprised of myself (Chris Van)- lead vocals and guitar, Archie Chikoti- guitar, Mat Sanderson- bass and backing vocals and Nick (Newbz) Newberry- drums. With the exception of Newbz playing percussion now and then for our friends Evicted, none of us are active in any other bands. How did the band get started and how did you meet up? Initially, the band, or rather the idea of a band was inspired by myself (Chris Van) and Sherlic White. Sherlic and I met online early in 2012 on a Facebook group called ‘Rock and Metal Lovers Zimbabwe’, which was in fact started up by a mutual friend of ours, Valentim Miguel Marques Pereira: another brother in arms hoping to kick-start a metal scene in Zimbabwe. Sherlic and I established a rapport with each other on the group and one day decided it was high time we met up to have a jam. From there, ideas began to flow and it got to the point where we thought it was time to get other people on board so we could execute the ideas in a band setting. Sadly though, Sherlic left the country to study in South Africa. He and I then agreed that I would continue pursuing the project without him. I had played in previous bands with both Archie and Newbz and because of the long history I had with them, I asked them if they’d like to join. At that point, we were one musician short so I decided to get an audition advert put up for a second guitarist. A while after that Mat came in to audition at Newbz’s house. Although, to this day I’m not sure Mat was ever aware that he was even in an audition because the setting was so informal – more like a jam session with more beers than any of us could justify than an audition. At some point, we ended up doing a switcharoo experiment putting Archie on guitar and Mat on bass. That arrangement seemed to work better, and it’s stayed that way ever since. What sort of bands inspire you and are the basis for the sound of Dividing The Element? For me, Metallica and Nirvana were big influences in my early teenage years, if you listen to our song Kumba Kumusha I’m sure you’ll notice the similarities in James Hetfield’s vocal style in places. System Of A Down also provided a lot of inspiration with the idea of vocal harmonies. When I discovered Numetal bands like Korn, Linkin Park, Disturbed, Limp Bizkit and Slipknot etc. that’s when I taught myself how to scream. As I got older though and discovered more music, my taste got a lot heavier. Discovering bands like Lamb of God, Parkway Drive, As I Lay Dying and various deathcore bands like Suicide Silence and Carnifex inspired me to learn how to growl. On an instrumental front though we like to experiment with fusing different styles of music so it’s quite hard to pinpoint the exact sources of inspiration because it can basically come from anywhere, but it always reverts back to some kind of metal sound at the core. Which would you say is the core message behind Dividing The Element. As in, what do you want people to take away from your music? I guess the most common theme in our music is that lyrically, we write about personal life experiences in Zimbabwe that either one of us or all of us have gone through. That said, it would be nice to know that there are other Zimbabweans out there who can relate to what we write about. Mostly it starts out with me writing the skeleton of a song and then the other guys come in to help bash it out and fill in the blanks at rehearsals. I’d say it’s both. A few months ago you released your record, which was self-titled. What can you tell about the record, the process of writing and what inspired it? As I mentioned before, the content of each song lyrically was inspired by life experiences, so the album is quite personal. Some of the songs seem to contain traditional elements and language. Can you share a bit about that and why you’ve chosen to make this part of your music? This was an idea my fiancee suggested to me prior to the conception of the band. It was done in order to help initiate a metal scene in Zimbabwe. There was once quite a big rock scene in Zim, especially in the 80’s. It seemed to die a slow, silent death though and then all of a sudden there was nothing left. So because I am a Zimbabwean and a metal head, the idea was to bring the two together and make a metal band in Zimbabwe for Zimbabwe. Using the local vernacular and incorporating traditional themes into the music was the best way to go about it as a means of identity. So when the band eventually formed there was already a direction and sense of purpose in mind. What sort of scene is there in Zimbabwe and how big is it? The scene is small. When we first started, metal heads were around, but few and far between. None of them seemed to know each other either, but it has grown in leaps and bounds from where it first started and seems to continue to grow. At every show we play we see new faces which is very encouraging. Which bands brought the genre to your country? As I mentioned, there was once a rock scene here in years past. I sadly did not have the privilege of experiencing it though. So I’m afraid I can’t accurately say to be honest, although I’m sure there are other more historically learned people around who are able to offer their opinions on the matter. No one’s censored us or anything like that but Zimbabweans can be conservative. So I’d say generally people who haven’t heard of us or the genre before approach it with caution, coz it’s new to them and people always seem to have preconceptions. But metal is mostly an underground thing anyway, it’s not for everyone nor is it meant to be. I notice that a few African countries have a metal scene, notably South Africa and Botswana, with a few bands like yourselves in surrounding countries but then it would seem to simply dry up. Is that also the reality or do you connect with bands from Malawi, Tanzania, DRC etc.? How important are the cross-border connections for you? Yes, we do connect with other bands, it’s very important. I think there’s always a chance that things could go wrong and all of a sudden the wheels stop turning. Cross-border connections are very helpful especially if we want to tour outside of our own country. Knowing where the scenes are and how big they are really helps. It’s also just a good support system to have, and provides a great opportunity to interact with other like-minded people, in some cases even make new friends. How’s the availability for everything, like rehearsal space, instruments, music, venues to play at and so forth? The Zimbabwean economy is still in a fragile state right now so it can be tough. Entertainment doesn’t fall high on the priority list, although there is a lot of optimism that things will make a change for the better, economically speaking. Hopefully, they will. Which bands from Zimbabwe should people definitely check out and why? Definitely check out Acid Tears, Chikwata 263, Evicted, Kamikaze Test Pilots, and an industrial melo-death project called Nuclear Winter. These bands range from hard rock to soft afro-rock to mbira punk. All of them have their own flair and character. Our plan is to promote our album in whatever capacity we can, so hopefully a few more shows in Zimbabwe this year. We’ve also been invited to a metal festival in Botswana next year and have committed to it. We’re very excited about it. If you had to compare Dividing The Element to a dish, what would it be and why? I’d say classic meat and potatoes with a hint of some kind of fish taste that you can’t pin point why it’s there or where it’s coming from. Reasons for that- we haven’t really reinvented the wheel but there are times where things can get changed up in a very unexpected way. That, and I really like fish.